Note that there is frequently a tradeoff between 2 and 3, in that minimizing the BLT can increase voiding, so, pragmatically, a minimum of around 10 microns (0.4 mil) is most commonly used. A smaller BLT also has the effect, often neglected, of making the contribution of gold-metallized soldering surfaces on both the die and submount non-trivial, so skewing the alloy away from the ideal eutectic. 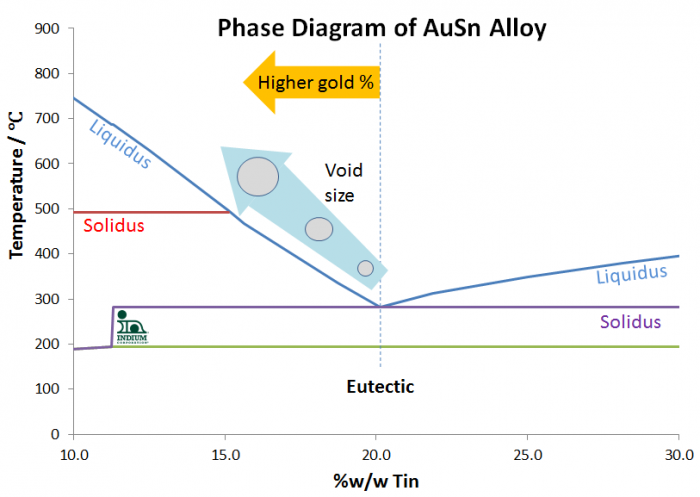 The details of the gold-tin phase diagram (as shown below) illustrate the main effects on the liquidus (and possibly even the solidus) of the alloy as the gold content changes. As the liquidus increases, so does the tendency of the alloy to "freeze-in" voids; that is, rather than voids being able to shrink as their internal pressure decreases and reach their natural minimum size as the solder solidifies at the eutectic point, they are trapped within the solidifying alloy at a larger size. 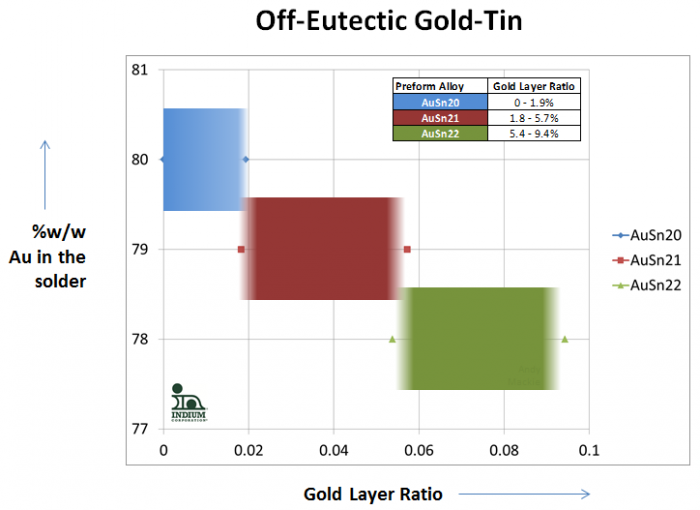 The obvious way to maintain the weight ratio of tin (Sn) to gold (Au) at 1:4 is by either minimizing the amount of gold on the metallizations, or by adjusting the tin content of the solder used, so that the eutectic is achieved in the final solder joint. 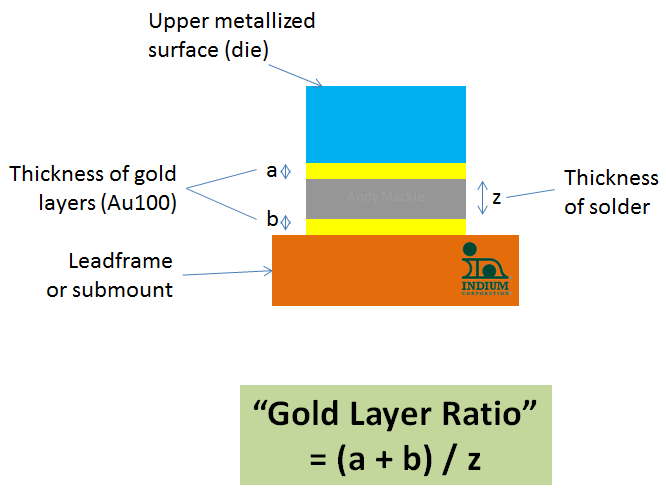 One way of thinking about this is the ratio of all gold in the metallizations, versus the thickness of the solder. If the solder is a preform at a 1:1 area ratio to the surfaces to be joined, then it is the thickness of the preform (see below). This is the "Gold Layer Ratio". Using this approach, the Gold Layer Ratio can be used to guide you to the best "off-eutectic" gold-tin alloy to minimize voiding in gold-tin eutectic solder joints, using the alloy and metal densities as a guide to building a simple model for solder joint formation, as shown below. For example if you have a 0.2micron (200nm) thick layer of gold on top of nickel/tungsten as a die metallization, and a 0.4mm (400nm) layer of gold on nickel as a substrate metallization, with a 15micron thick gold/tin preform, the gold ratio is 0.04. This would suggest that a preform made at the Au79Sn21 off-eutectic would be the best choice to minimize voiding. These alloys, usually at 1.0% increments (AuSn21, AuSn22), are available in preform, wire, sphere, and solder paste forms, and are, of course, slightly lower in cost than the standard AuSn20 alloys due to the reduced gold content. Please let us know how we can help you meet your soldering needs!